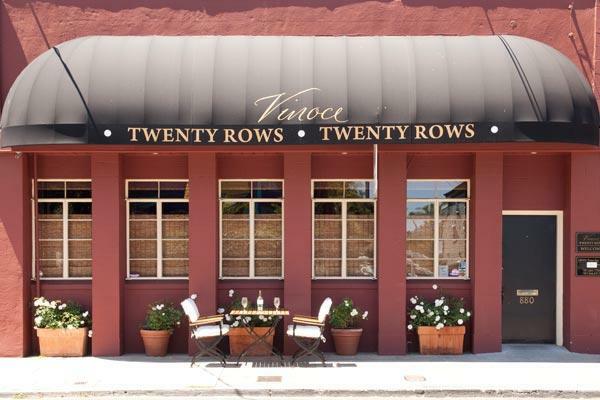 Twenty Rows is just minutes driving north of downtown Napa and is located in a non descript location surrounded by businesses such as a machine shop, dance studio, automotive repair, upholstery...well you get the idea. This is not your normal "up valley" winery! Looks are deceiving and it is wineries such as these that are fun to seek out; they are the only "working winery" located in downtown Napa. Twenty Rows is appointment only and is setup to see small groups for private tastings. However with that said, they often hold tasting events and other wine related happenings within the winery. Check their website for the latest. This winery is very much a family affair – for a number of years Twenty Rows shared the winery facility with other wineries including Robert Craig but after the other wineries moved their operations Twenty Rows took over sole ownership of the facility. The owners Lori and Bryan Nuss have been farming vineyards on Mt. Veeder since the early 1990's. Robert Craig (long time vintner in the Napa Valley) was Bryan's initial inspiration and mentor in the wine industry and helped him during his first years of winemaking. Today Bryan is the primary winemaker for both Vinoce (their high end limited production label) and Twenty Rows. Son Tim handles most of the tasting appointments and his golden touch in the winery shows; he has redecorated the interior of the winery which is now very spacious and includes seating; this is a great place for tasting and hanging out. Vinoce-Twenty-Rows - The name Twenty Rows comes from, you guessed it, 20 hillside vineyard rows from their home vineyard on the slopes of Mt. Veeder (north west of downtown Napa). These rows have always produced quality fruit but never found a home in their Vinoce label so they decided to bottle this as a separate label. As Tim told us in regards to the Twenty Rows wines, "this is Napa wine that you can drink everyday". True enough – all their red wines are priced the same and their one white is slightly less – all the wines are $20 or under. Try finding Napa fruit at those prices – there just aren't that many Napa producers with that type of pricing. Compared to their other brand, Vinoce which is boutique and very small production, Twenty Rows as of the time of this review is around 14,000 cases. Their first vintage dates from 2003.